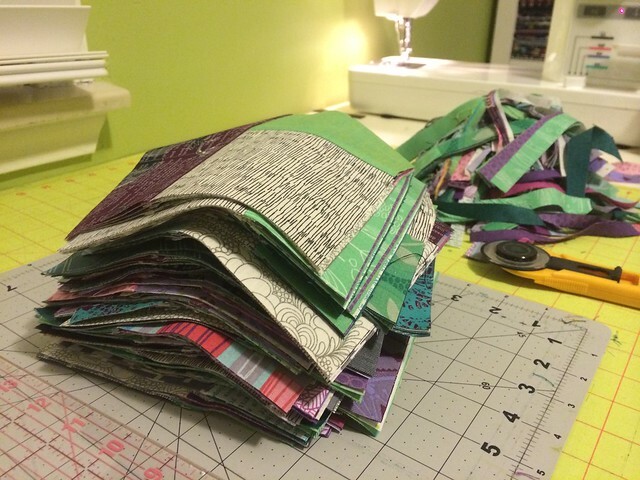 Several people in the Ann Arbor Modern Quilt Guild have recently been making soft patchwork quilts out of double gauze and I've been meaning to try working with this type of fabric for months now. 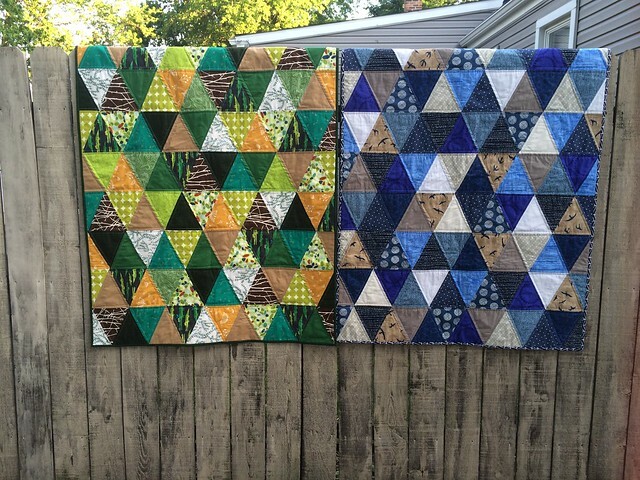 I purchased a bundle of Framework fat quarters from Westwood Acres in May and I finally cut out squares and played around with the placement this week. I was going to go with a simple design, but after thinking about it for a bit, I think I'm going to add a thick white inset border to the quilt. This should add more of a focal point and increase the size. 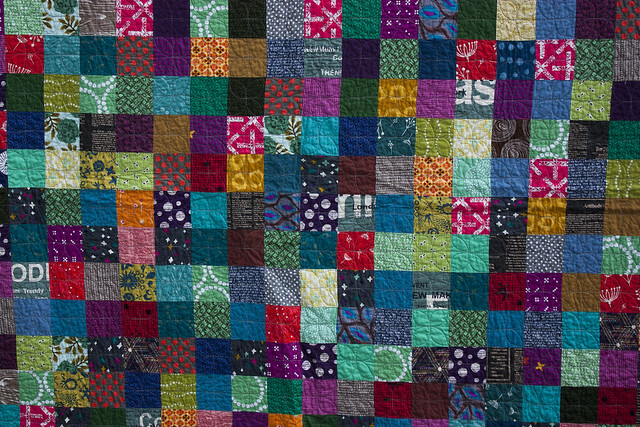 As it is above, the final quilt would only be around 48" x 60". 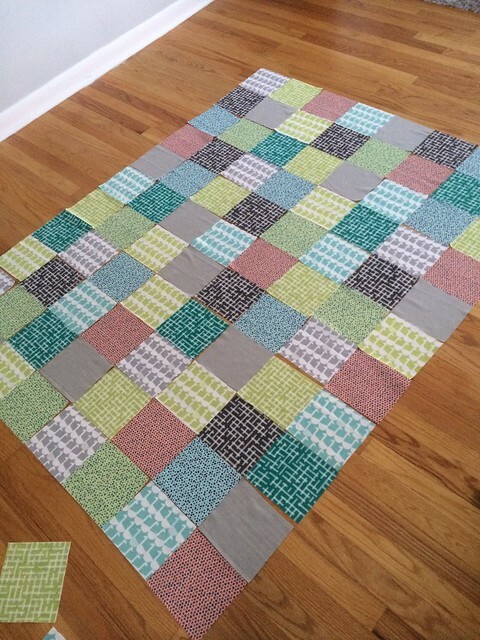 Once the top is put together, I plan to turn this into a long term hand-quilting project. 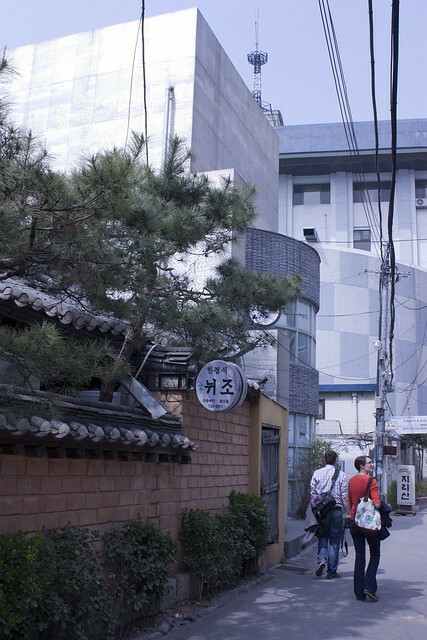 It will give me a chance to enjoy the feel of the fabric and it should help to avoid some bunching that machine quilting might cause. 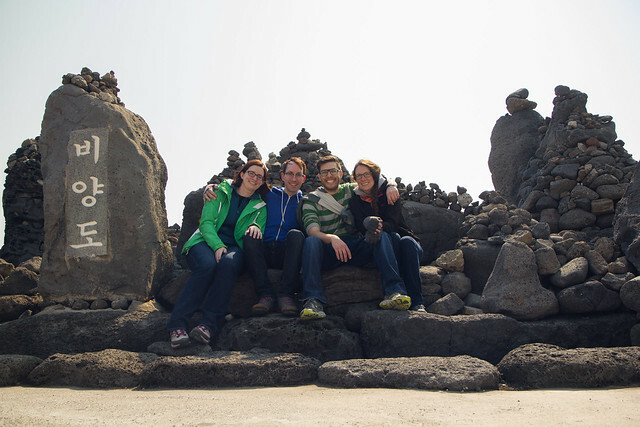 My sister introduced us to our good friends, Ben and Hannah, after telling us that we have tons in common and would get along well with each other (she was right!). 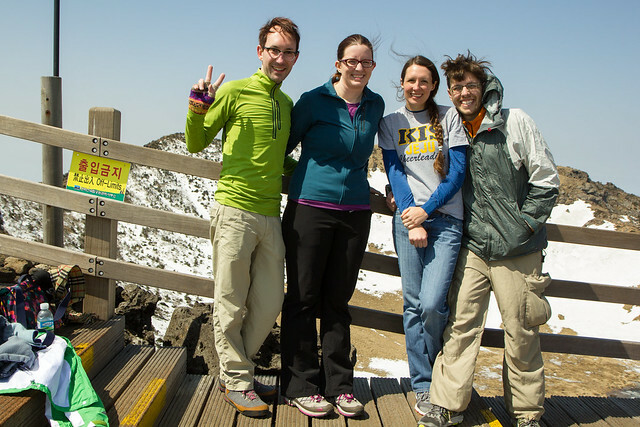 They moved to South Korea last summer when Hannah accepted a teaching position at an international school. 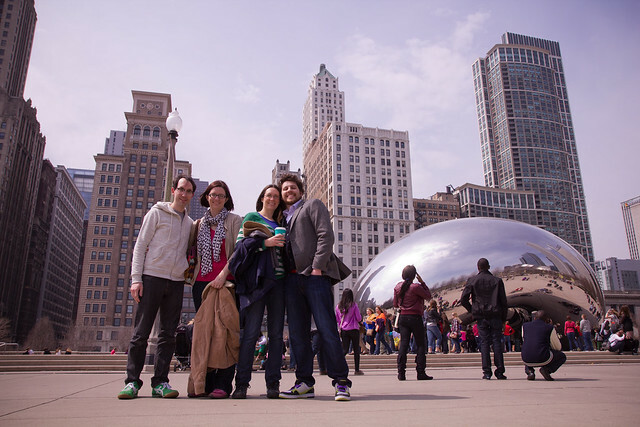 We had one last hurrah stateside in Chicago before we said our farewells. 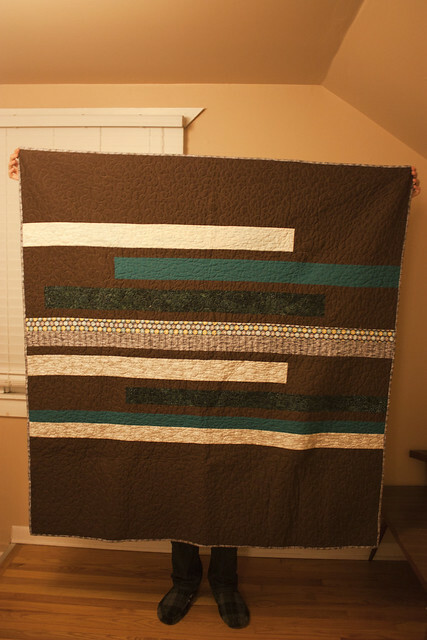 Here's a quilt I made for Hannah as a graduation present for finishing her master's degree. The pictures are horrible as they were taken in the dark minutes before we had to leave for her grad party (in the middle of December 2012). 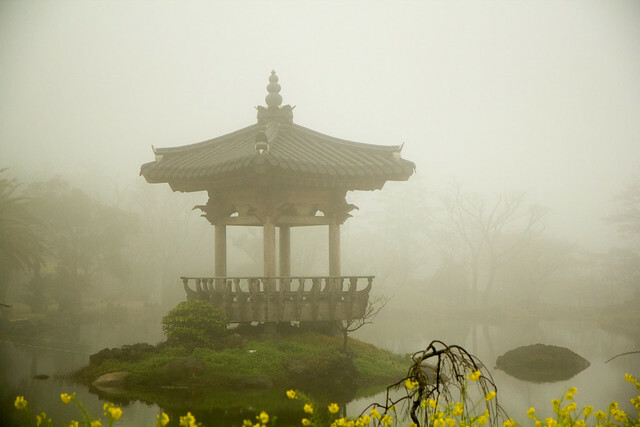 Ben & Hannah love Asian culture and I made this to reflect their interests and to match their living room furniture. 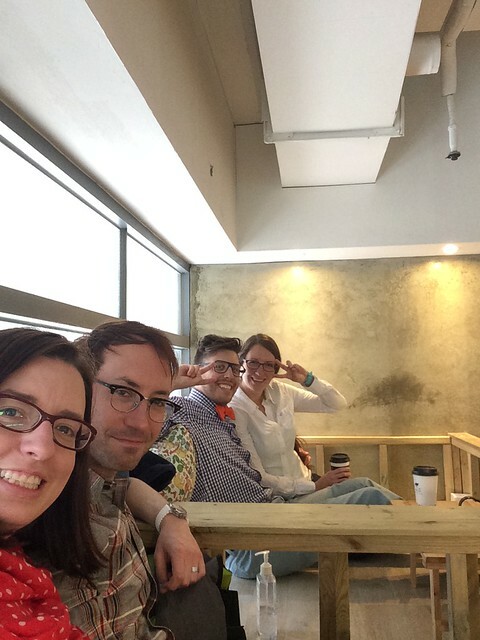 We spent many hours watching Korean dramas, Downton Abbey, The IT Crowd and The Mitchell & Webb Look together, so we became quite comfortable with their couch! 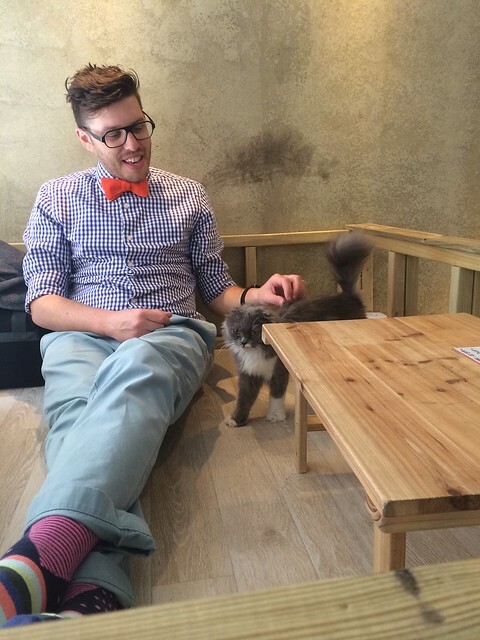 As you can imagine, visiting a cat cafe and dog cafe were some of the highlights of our time in Seoul! 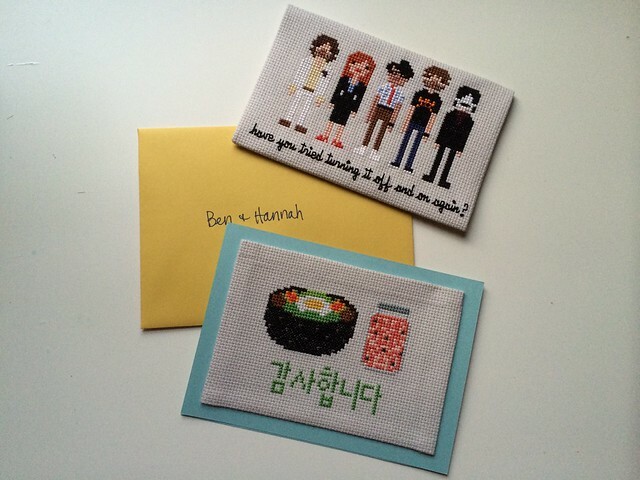 I also made a cross stitch magnet with the characters on the IT Crowd (pattern from weelittlestitches on etsy). 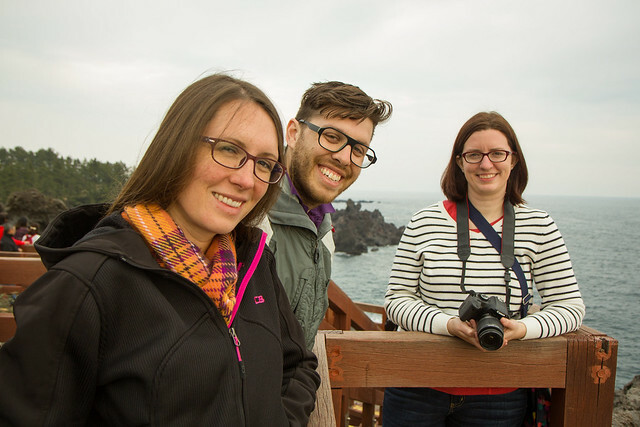 Here's a few more pictures we took while visiting Jeju Island and Seoul. 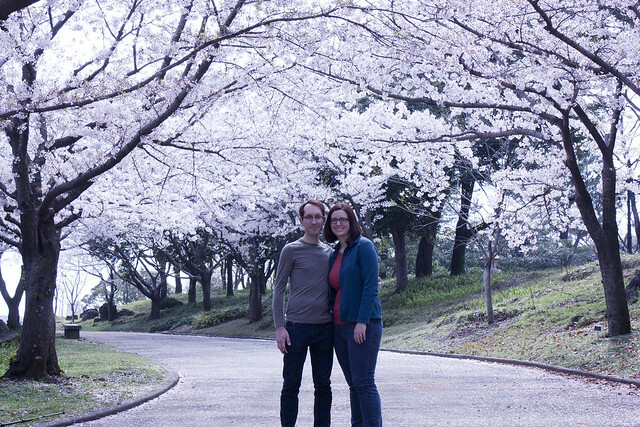 We were so fortunate to be able to see the cherry blossoms in full bloom! 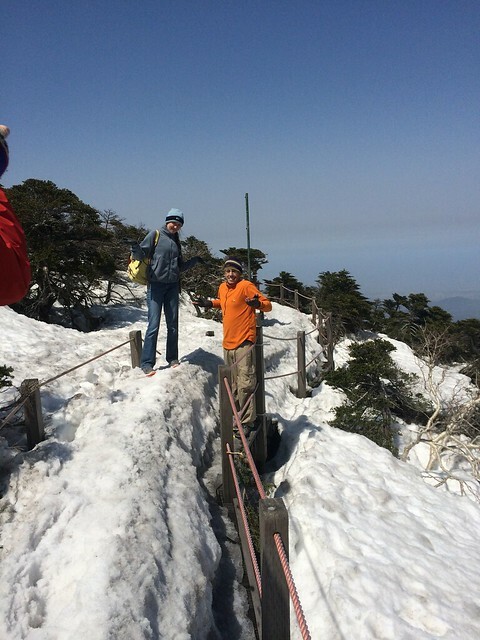 The snow covered trails on the snow-capped mountain were insane. 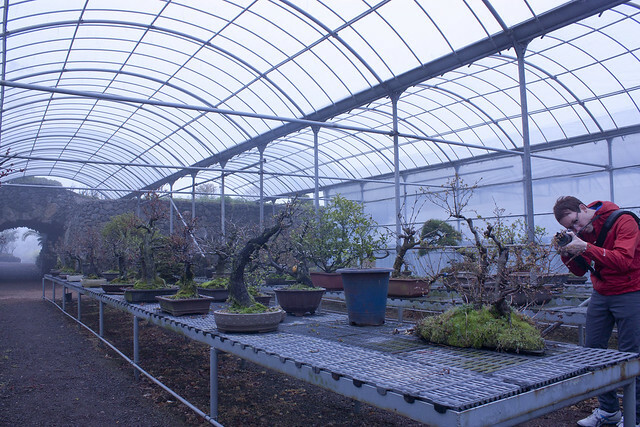 Jon was in heaven seeing all the bonsai plants in progress. 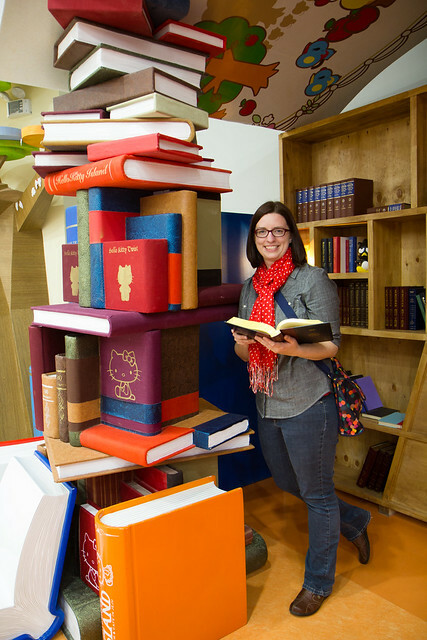 Posing in the Hello Kitty library at Hello Kitty Island. 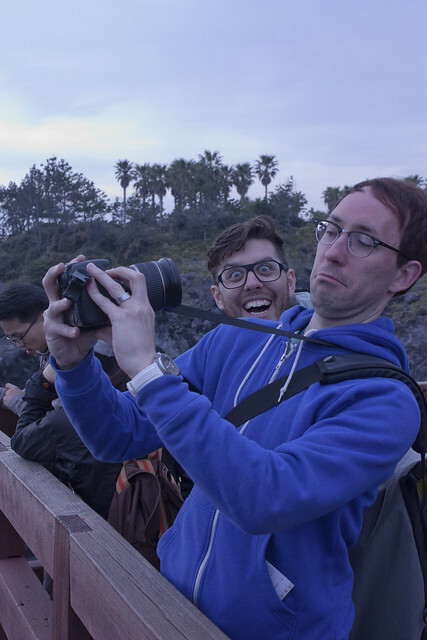 Jumping on the selfie bandwagon! 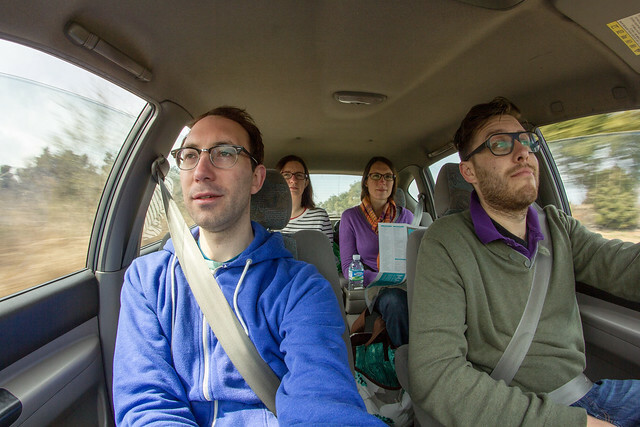 At the beginning of 2014, I found out that two of my college roommates were pregnant and due a day apart from each other. 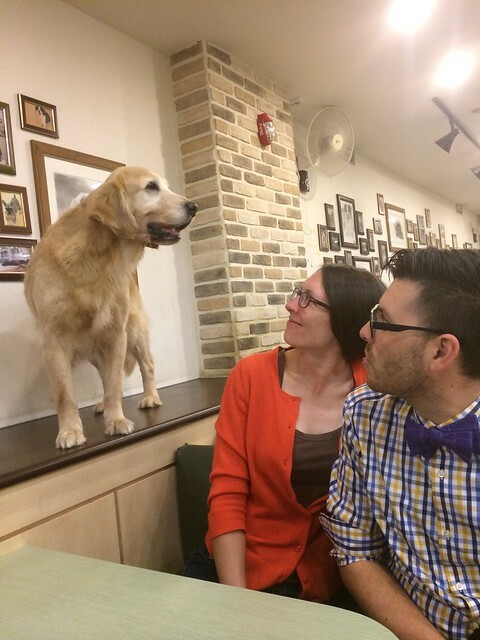 A few months later, they both learned they were expecting boys. 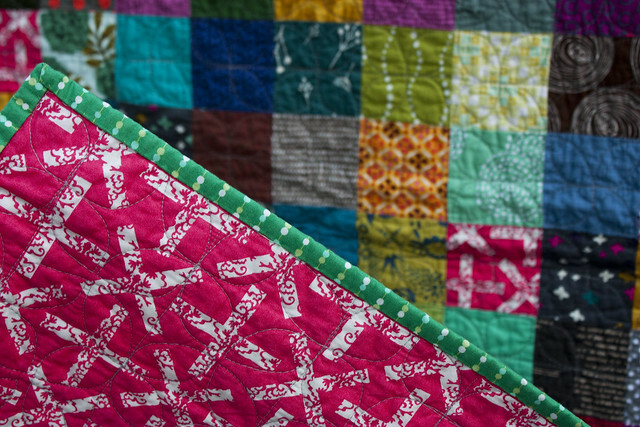 I set out to make two different but similar quilts that capture their mother's personal tastes. 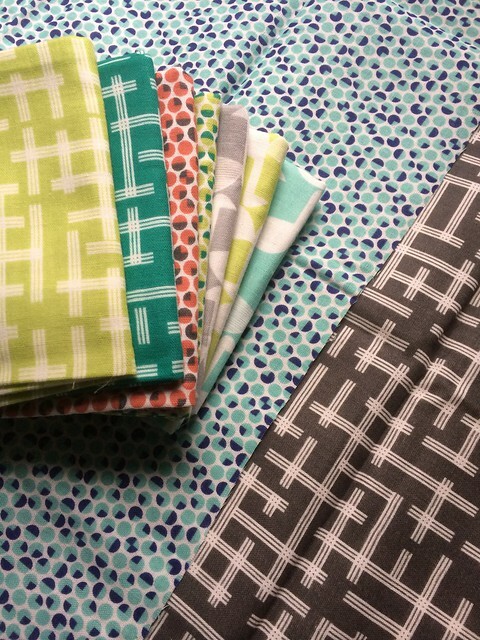 Emily is super classic and traditional, so I pulled a palette of navy, gray and cream fabrics. I love the variety of prints and textures in this one. Amber and I spent our entire freshman year thrifting for the perfect kelly green graphic tee (spoiler alert: we only found one shirt each). 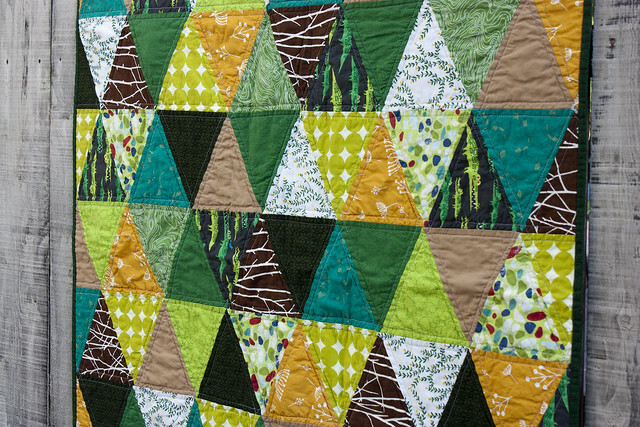 We both still enjoy the color green, so I knew I had to feature green in her quilt. 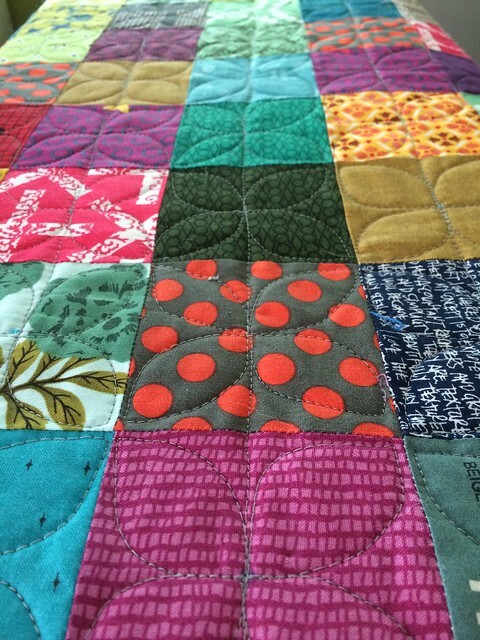 I backed Amber's quilt with a flannel fabric that is so soft. I liked it so much that I stocked up on this print in red and black for future quilt backs. I'd highly recommend using flannel for a super soft and warm quilt. The only difference from regular quilting cotton is that extra lint collects in my bobbin case. 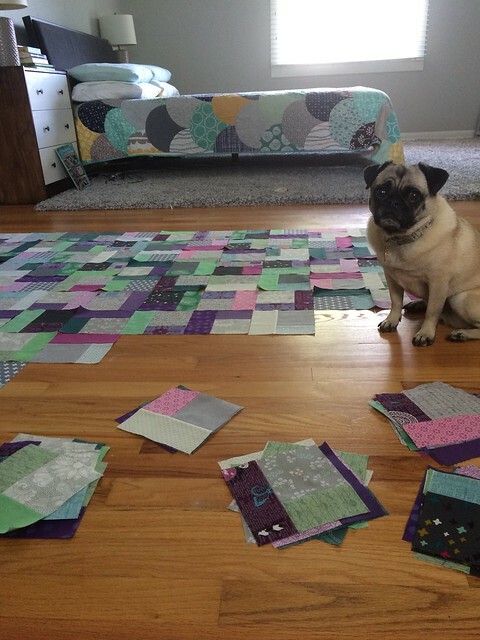 Quilting with it didn't create any problems. I waited until each baby was born to sew on a personalized label with the babies' first and middle names. This is actually the first time I've ever used a label on a quilt. 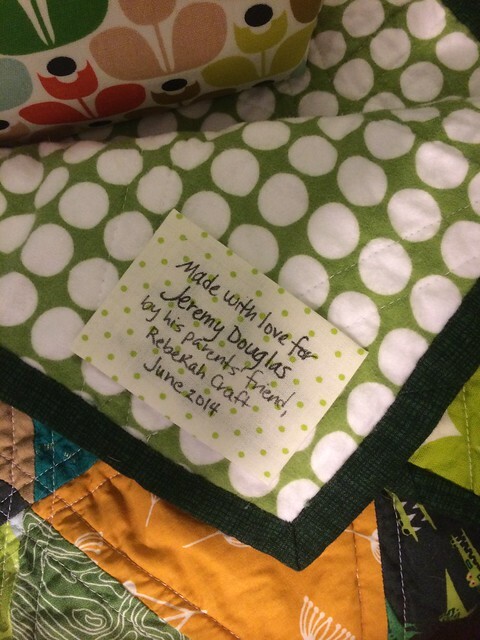 I don't know why I've never done this before and I'm definitely going to make sure that I label my future quilts. My youngest sister, now 25, received a baby blanket when she was born with a label that said "handknit by Audrey Jensen." To this day, we still refer to her blanket as the Audrey Jensen blanket. I love that it has a name and that her blanket is still treasured! 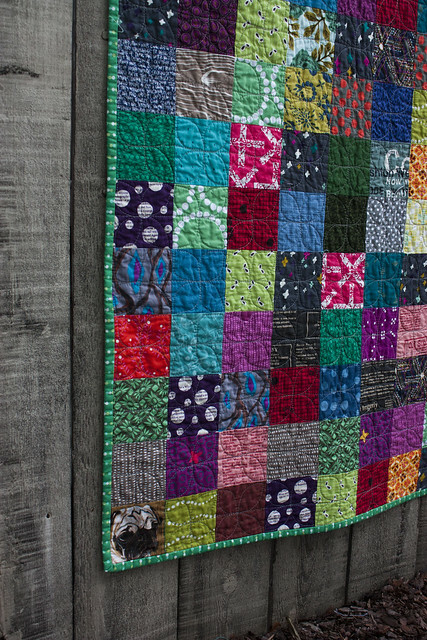 I hope my quilts will receive as much love in the future. 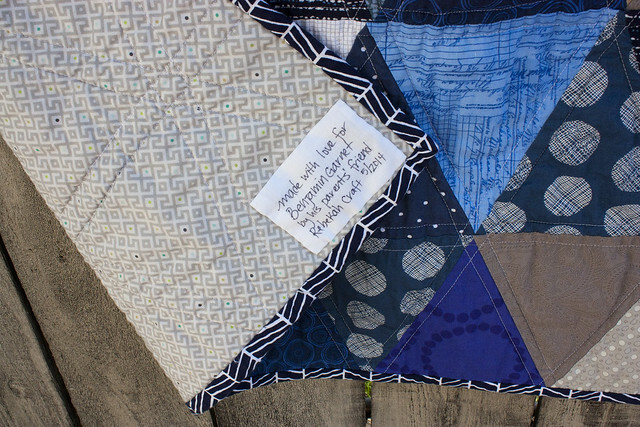 For each of these quilts, I used an isosceles triangle ruler with 5" triangles. They're around 42"x60" but I completely forgot to measure these before mailing them off so that's just a general guess. 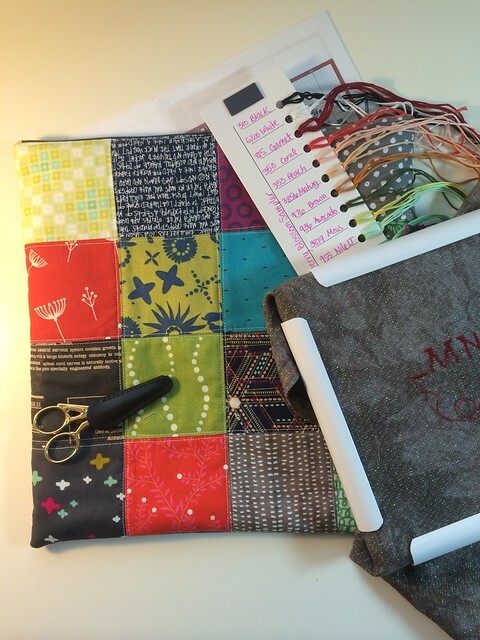 Several months ago I purchased Angela Walter's quilting class, Small Changes Big Variety, from Craftsy and I finally got around to watching parts of it on Sunday. 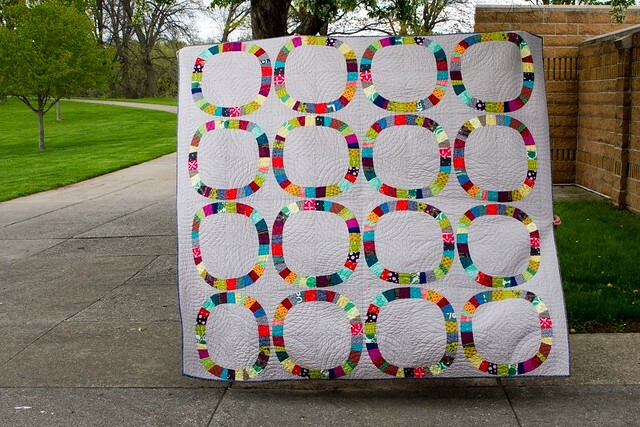 I love how she encourages students to just freehand things, use blending thread, and not to worry about "mistakes" because they are so minuscule in comparison to the overall quilt. I decided to try out her overlapping squares pattern and am having fun working on getting those corners just so. It's a nice change up from the stippling that I've done in the past. I've never seen this type of construction before and I'm excited to watch this come together, so much so that the day this book arrived in the mail, I pulled out a set of fabrics and immediately cut the 2.5" strips to get started. The cut fabric sat around for several weeks until I sewed the first pair together at our guild's monthly sew in a few weeks ago. I've paired them into groupings of 8 strips and they're waiting until it rains outside so I can have a chance to sew them together. (tutorial at Maureen Cracknell Handmade) in a summer sunset colorway. I think I'm going to turn this into a gradient quilt to make it look like an actual sunset, but I'll wait until I have my pieces cut to plan the final layout. I'm experimenting with house and door colors, which means some ripping out of work until I get it just right. I'm so not a Halloween person (other than liking purple? 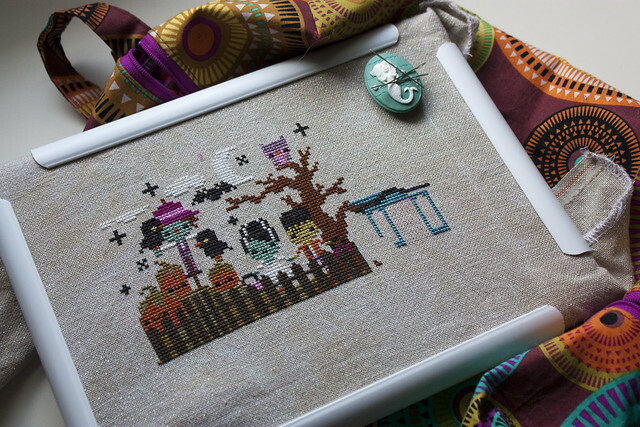 ), but for some reason this pattern totally called my name and I'm really enjoying this project (the owls, the bonsai looking tree, the cute house, the picket fence). I hope to have this finished and framed in time to display during October. 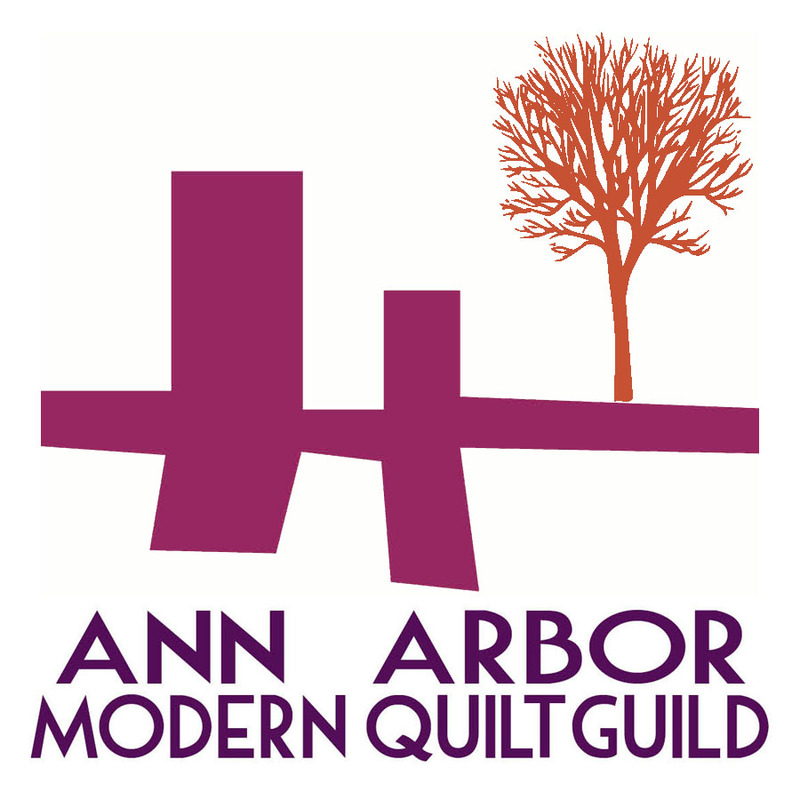 The Greater Ann Arbor Quilt Guild's biennial quilt show is this weekend and they're hosting a special exhibit of quilts by the Ann Arbor Modern Quilt Guild. Two of my recent quilts were accepted into the show and will be on display this weekend, Saturday and Sunday, July 26-27. 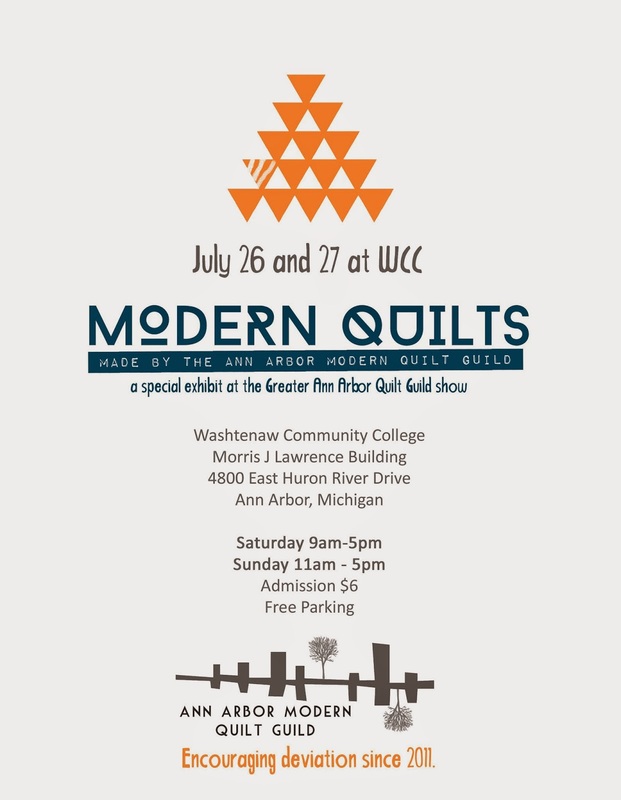 If you're in the area be sure to visit the show. 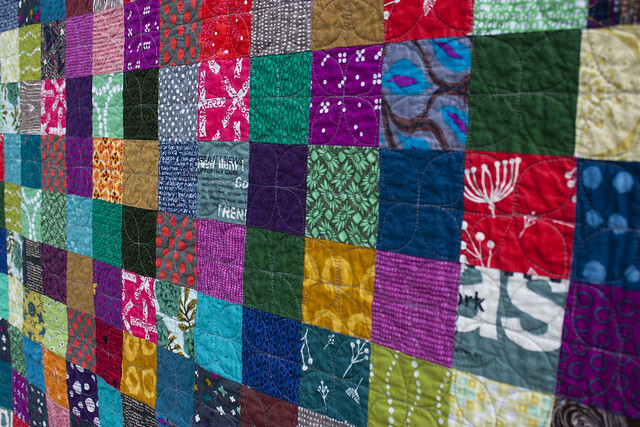 I'll be working at the show on Sunday afternoon and am looking forward to seeing some inspirational quilts throughout the day. 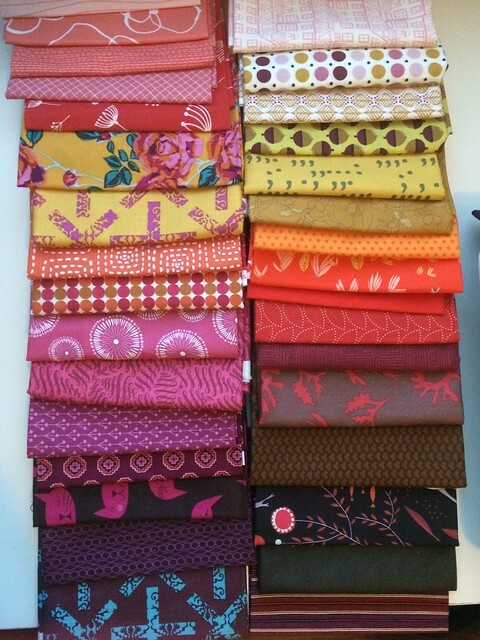 After cutting out the pieces for my Single Girl quilt, I ended up with nearly a fat eighth of each of the 35 fabrics. 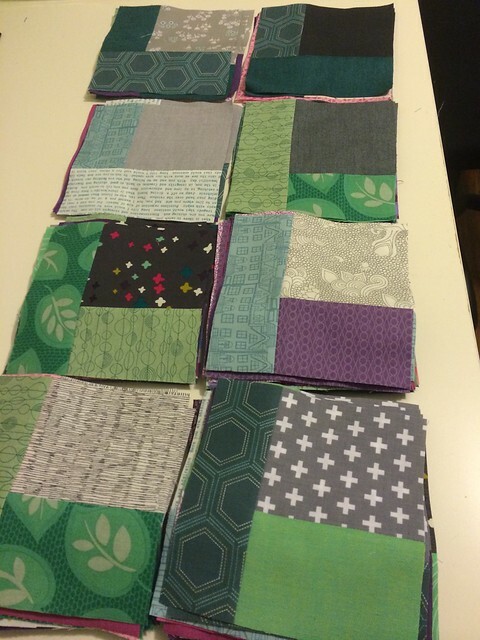 I cut the leftover fabric into 3.5" squares and stored them away for a later patchwork project. 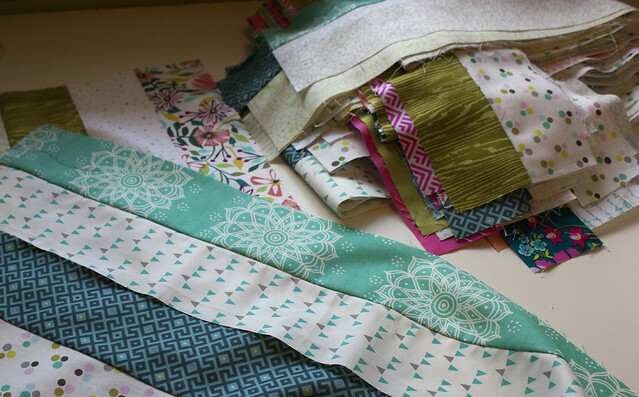 I loved how the Single Girl quilt came out, but I wanted to see more of the fabrics featured in a new quilt. 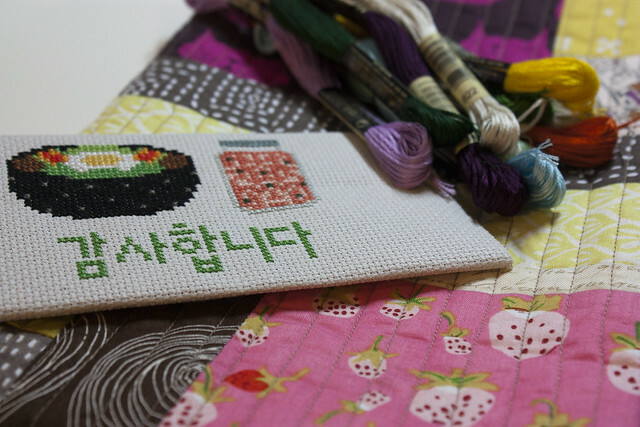 First, I took 32 squares from my pile and made a cross stitch project bag. 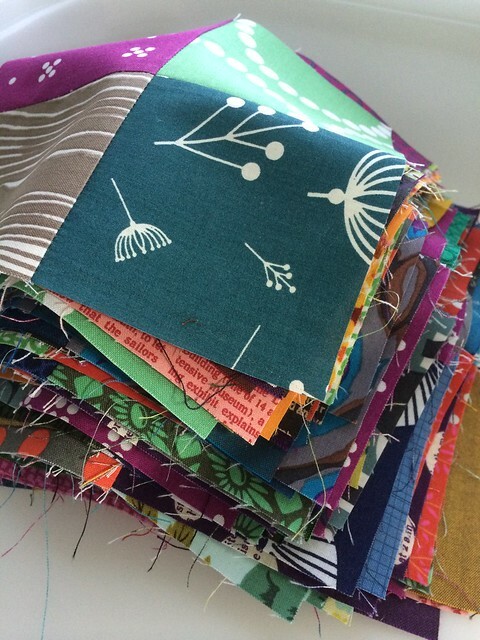 Then, when I finally got the urge to do a large scale patchwork project, I dug around in my scrap bin to pull out more coordinating fabrics. 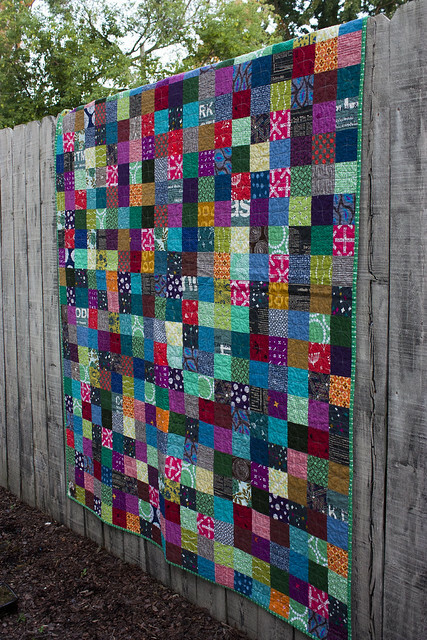 This quilt used over 500 squares. I started by chain piecing pairs together until I ran out of fabric. 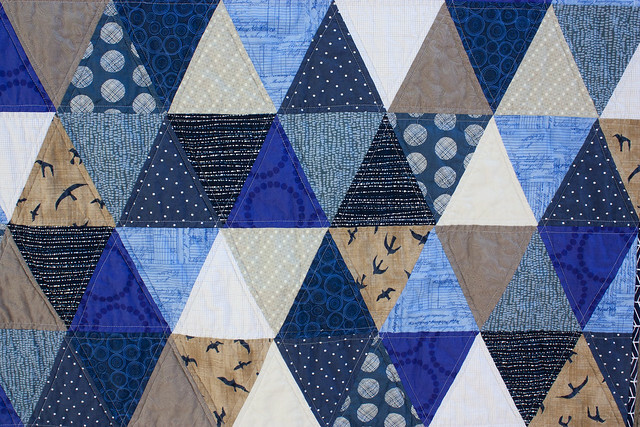 After, I chain pieced pairs together to make small blocks. 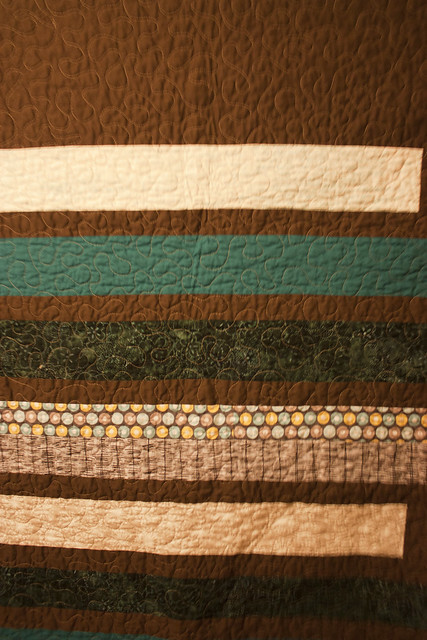 After the quilt was assembled and basted, I almost started quilting it with diagonal lines. Then my neighbor and quilty friend, Christina, suggested that I use dogwood quilting again. I balked at the suggestion because it takes so.much.work and so.much.thread, but I soon realized that she was right. I'm so glad I took the extra time to densely quilt this one. 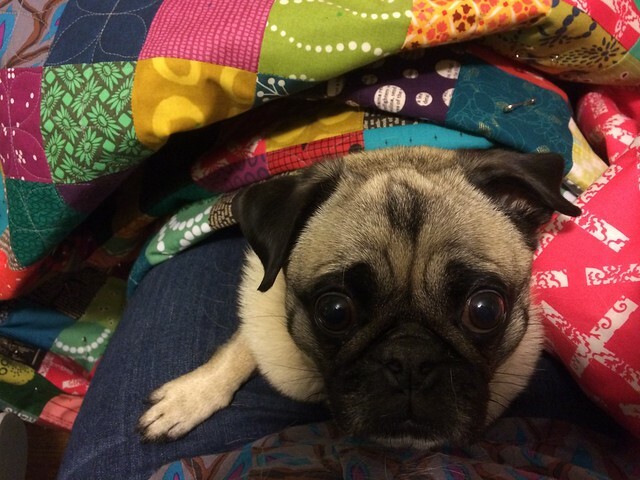 It gave me lots of time to enjoy each piece of patchwork that went into this quilt, and it gave Koko and I some great lap time together (yes, it's quite difficult to maneuver around a lap dog while quilting). I've recently discovered the ingenuity and forward planning that is stocking up on 5 yard pieces of backing fabric when it's on sale. 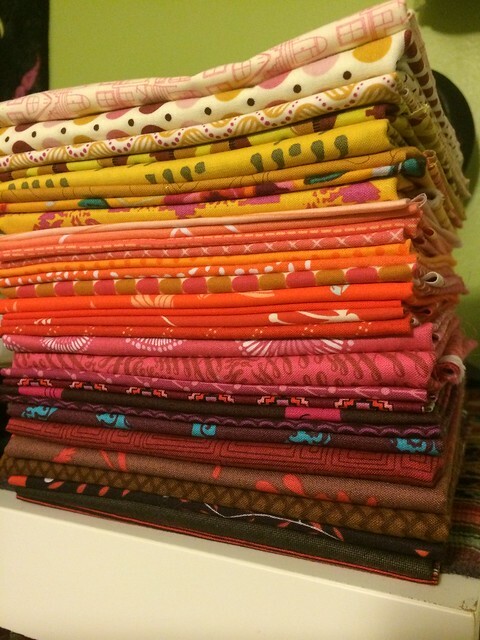 If I stick to buying fabrics I love, I will no doubt be able to use them as a backing in the future. I used this great hot pink Sun Prints x+ fabric from my stash for the back and then used a stripey dotted green for the binding. 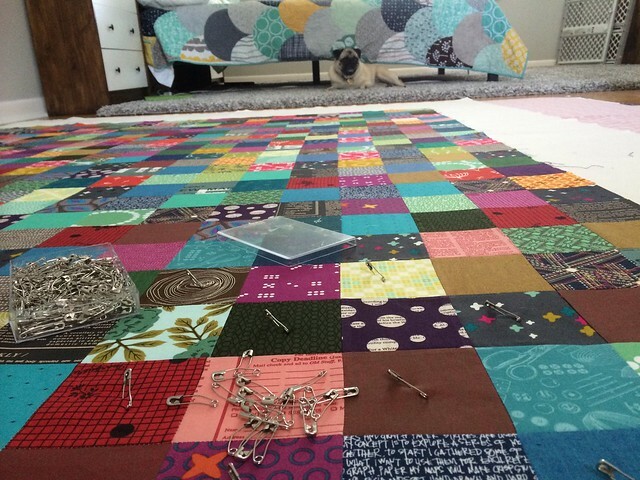 As a fun feature in the bottom corner, I added a scrap of pug fabric that my sweet guild mate, Vicki, gave me. This quilt has been elevated to my living room couch quilt until my next favorite comes along. 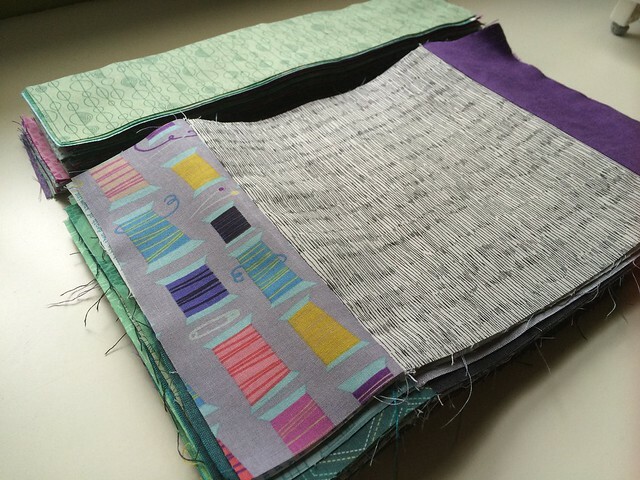 Inspiration usually strikes me when I'm incorporating new fabric acquisitions into my stash. 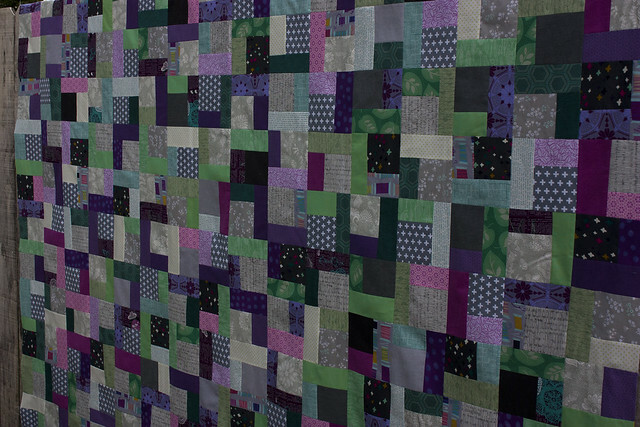 For this quilt, I started combining colors from a new bundle of peppered cottons and pulled out a grouping of mint, fuchsia, eggplant, steel grey, and black. 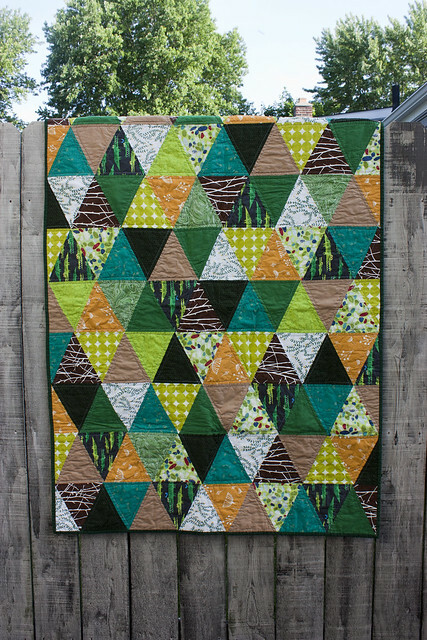 After adding some coordinating prints, the stack sat in my sewing room for a week or so until I remembered that I had been wanting to make a quarter square log cabin. I first stumbled across Rossie's quarter square log cabin tutorial on her instagram feed. 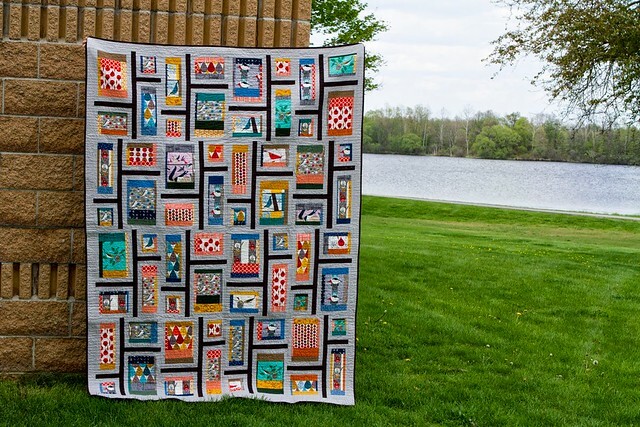 She created this quick video that demonstrated how easy it was to make quarter square log cabins with an accuquilt die. 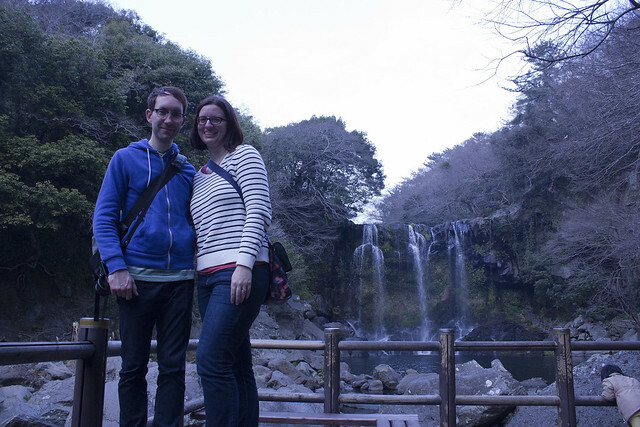 I later searched her blog and found a tutorial for the process in this blog post. I used the same measurements for the blocks that Rossie used. The centers of each square started at 8"x8" and the side strips were 3"x8" and 3"x13". For this quilt, I made 48 large cabins and then cut them each into 4 different 6"x6" squares (196 final blocks). I used up most of 24 different fat quarters for this quilt. I didn't have enough of one fabric to make all of the centers the same, so I stuck with grey and black solids and prints to help unify things. It took a bit of time to lay out the quilt...more time if you count all the shooing away I had to do to keep Koko from walking over the floor (it's hard to resist that face!). 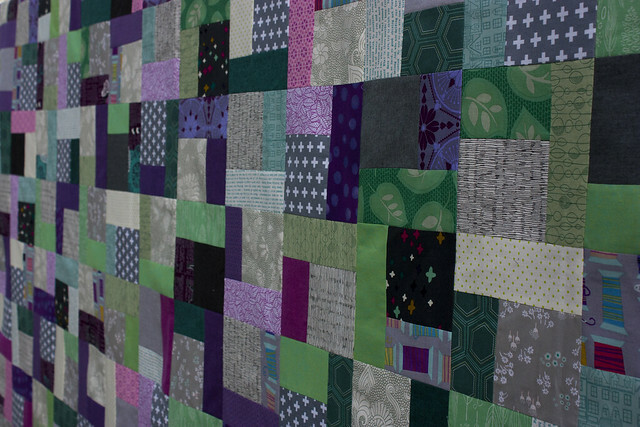 I ended up using a controlled random patchwork pattern by alternating two block orientations every other row. 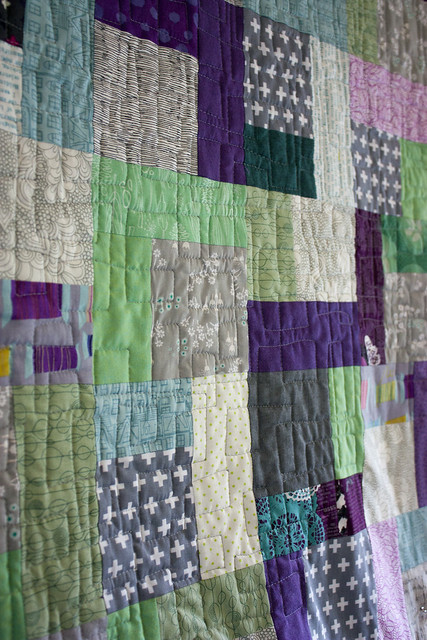 This quilt recipe is such a fun way to make a patchwork quilt with lots of variety. 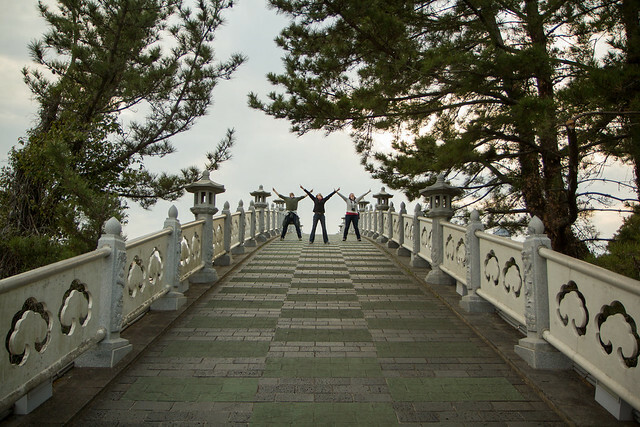 The final top size is 12 blocks (66") by 16 blocks (88"). 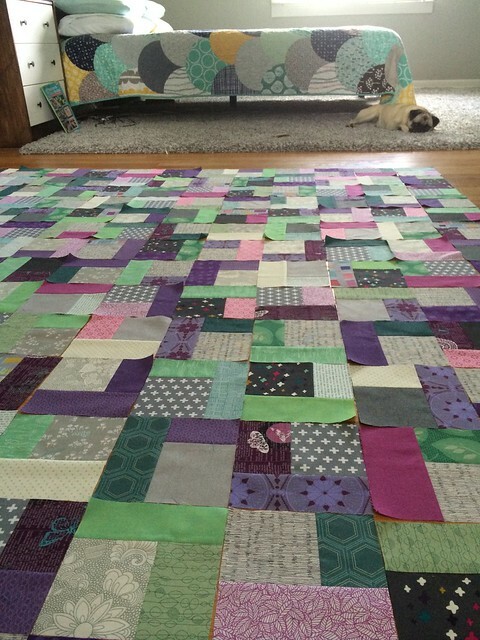 I finished basting the quilt last Sunday night and now I'm letting it sit until I find the perfect quilting pattern. 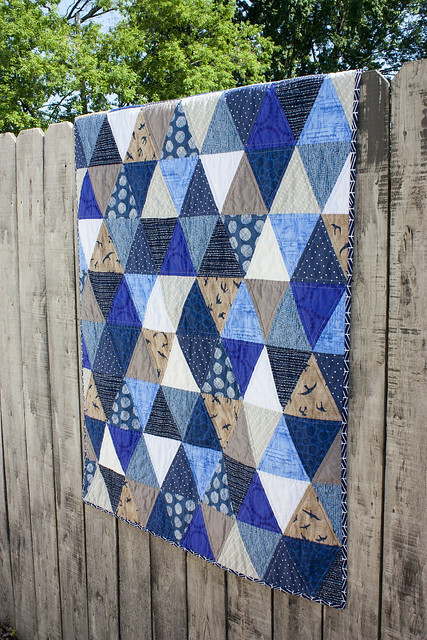 I'm linking up to Freshly Pieced WIP Wednesday for this post.